An impressive body of work by artist Leonard Ragouzeos was exhibited during the month of February on the walls of Amy's Bakery Arts Café in downtown Brattleboro. The work selected by the artist spanned a period reaching back to the turn of the decade and comprised two distinctly separate areas of artistic thought in which he has been involved. The artist is quick to point out his tendency to switch gears, explaining that a line of thought he has been involved in previously can and does resurface, growing from the experience of involvement in an alternate mode. The show at Amy's also made it quite clear that this artist has much to express in both the language of figurative art and in a clear personal vocabulary of abstraction. The abstract works were created with gouache, an opaque, water-based paint, on paper. A stunning and refreshing series of pieces included were composed in an 8-inch-square format. These works combined two contrasting elements, interacting and in some cases bonding together, in an unexpected, playful eloquence. The grounds in these works are usually simple checkerboard grids with alternating squares of white and black. These grids are explored in varying scale, the squares ranging from small, 1-inch size, in a busy checkerboard, to larger, 2-1/2-inch squares suggesting minimalist visual ciphers. Over these checkered grounds is added an opposing element, more improvised and fluid: a set of lines often resembling strings or pieces of twine that have floated onto the surface, landing lightly, in loose loops and amorphous coils upon the ebony and ivory grid grounds. Ragouzeos does not pull in his conceptual reins to the point of theoretical obsession, however, and a number of pieces from the series playfully introduce other visual elements such as symbols, numbers, or iconic, centrally placed architectural forms. "Rumors," one of the 8-inch-square works, showed the checkerboard at its busiest, with eight 1-inch squares per side. As in a number of the works, the edges of the small squares are softened and shaded at the edges, lessening the graphic austerity of the black and white grids of contrasting squares. 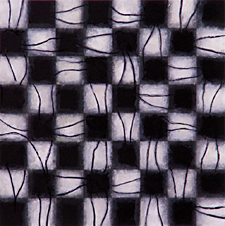 In this work, the stringlike lines are not overlaid but combine visually with the small black and white squares. Each of the white squares has two small wavy lines crossing it. These pairs of black gestural threads seem animated, almost dancing or twitching on top of their little white squares, like mouse whiskers or spider legs. The wavy sets of whiskers gesture this way and that, moving the eye of the viewer first in one direction and then in another, enlivening the surface in a different kind of visual checkerboard game. "Entering/Centering," hung to the left of "Rumors," represented the opposite extreme in the elemental combination used in the series of squares. This work had one large black square as its ground. Over this are a knot of circling and wandering transparent white lines which build on top of themselves to create a nestlike structure, the lines themselves embodying a sort of visual improvised thought. The strongly rendered, cleanly brushed white lines are interlaced with a few colored strands in orange, red, yellow and green. 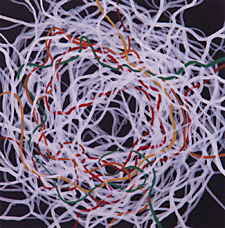 These color elements intertwine like hairs or bits of found string used by nest-building birds to bind their circling constructions together. The result is visually mesmerizing. The viewer's eye follows the lines through their spiraling wanderings, as they build upon themselves, reaching, curling, and bumping along, building the wiry floating donut shape. "Comic Tragedy" features a four-by-four-square checkerboard, again softened at the squares' edges. Thin, stringlike lines are drawn over the large squares in colors of yellow, green and red. There are two of each of the green and red lines, differing slightly in hue, the reds being one of cadmium and one of alizarin crimson, providing visual subtlety. The viewer can see where lines were previously redrawn and edited out, hinting at the compositional thought involved in "finding" the final result. Three small symbols of a ladder, a house, and a pine tree float in some of the white squares. The pine tree was also noticeable in another, larger, gouache work entitled "This Isn't Kansas." These symbols added yet another dimension to the work. The piece is light and airy in character, while being thoughtfully intriguing. Two pieces in the large room at Amy's seemed a pair, one being the black/white inverse of the other. These were entitled "Yin" and "Yang." The squares were about 2-1/2 inches and showed a three-by-three-square checkerboard. In "Yin" the center square is white and has two of the previously mentioned spider-leg lines radiating out, tentaclelike, against the four black squares around it. They seem almost like appendages, animating the center square, which begins to assume an identity. In "Yang," hung nearby, the opposite black/white checkerboard is featured and again the central square has little pairs of lines which create wavy appendages radiating out, against the four surrounding white squares. This time, however, the central square is slightly askew, shifting in its place, as if aware of the viewer. The pair of works seemed personal and were designated to remain in the artist's collection. Another piece in the squares series took the elements involved to an extreme, minimally. On a white ground, three dark wavy circles hover over a set of short stick-like lines arranged in a row across the composition. They visually resemble fence posts in the snow or the scratches made when counting time on a prison wall. Currently one might compare them to the slalom gates in Turin. The dark circles which hover like hand-formed heavy wire loops are black, blue and a dark turquoise but are close enough in value so that visually they shift, the black turning blue, and the opposite. This work, which recalls traditional Minimalist concerns, was entitled "Dune." 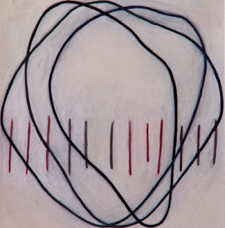 In pieces such as "Braniac" and "Blondie," the juxtaposition of the circling string lines against the softened checkerboard are explored further. Two works in the group featured centrally placed architectural forms. One introduces a water tower shape being integrated with the checkerboard, and another shows a symbol-like half-house combined with half an edifice featuring Greek columns. These architectural symbols seemed somehow personal in nature. Two of the artists mentioned as influences are Brice Marden and Sean Scully. 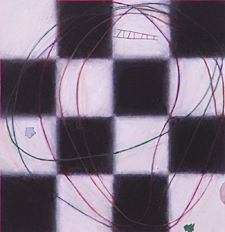 While the improvised circles in the works remind one of Marden's large paintings of similar forms, Scully's amorphous geometrics can be seen as an influence to the graphic elements of the checkerboards. The interesting thing here is how the two are combined. The large figurative works shown along side the abstract pieces were incredibly dynamic, both in scale and expression and were also available a smaller prints. These gigantic portraits of pieces of fruit, people and objects involved thought which alluded to Rembrandt's psychological self-portraits, Chuck Close's large photo-realistic portraits, and Robert Longo's paintings of fallen figures, (which now seem to point to the September 11 World Trade Center attack). These figurative works were started post-September 11 and are extreme in their psychological content. An excellent catalogue was provided discussing these newer works. Leonard Ragouzeos has relocated to Vermont after retiring from teaching art at the college level for over thirty years. 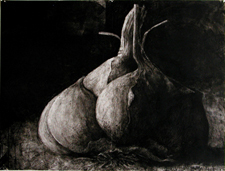 The exhibition at Amy's is our first glimpse at what this very knowledgeable and inventive artist has to offer. The addition of his original voice to the Brattleboro art scene is a welcome and sophisticated one. We look forward to upcoming developments in his work.